If other men’s daughters expressed an interest in the convent or the cloister, I wouldn’t have questioned it at all. I would have been respectful of their choice and genuinely happy for them. “What a noble and beautiful vocation!” or, “What a meaningful life with a holy purpose!” I no doubt would have thought. Isn’t it sad that my first thought wasn’t about Nora’s vocational fulfillment and spiritual well-being? My initial thought was that I might be missing my daughter’s presence in my home, and her gentle, delightful company. I had these thoughts because I did know some things about the cloister. I’d read Saint Therese’s autobiography, The Story of a Soul, with its description of her entrance into the cloister, and having to say goodbye to her grieving father and sister Celine. I’ve always had a hard time with goodbyes. I observed Nora’s spiritual confidence and serenity in her vocational choice as she first visited the Passionist nuns for a week-long “Come and see” discernment in November-December of 2013, and then her three-month “Aspirancy Visit” from February to May of 2014. I’d been dreading that goodbye to my only daughter. While waiting and praying through that time, I asked myself: Should I try to make her stay? Should I ‘guilt trip’ her into worrying about my grief and sadness?. . .I pondered the selfishness of that, and the manipulation and misuse of power and control dynamics it might have represented. I thought of the guilty I would feel if I looked at my daughter, entrapped by my selfishness. . . The thought horrified me! I’d considered religious life myself, and how would I have felt if someone had emotionally entrapped me, kept me from making a free choice about my vocation and lifestyle. I know that I might have resented that person, and felt grief for not answering our loving Lord’s attractive call. I looked at my daughter: a pure soul. A deeply spiritual young woman, wanting to discern God’s call for her, freely. She has the desire to conform herself to God’s Will that I have prayed for, for all of my children. . .[because] to be authentic followers, we have to be open to all choices, not just for ourselves, but for all of those we love. When Nora came home from her three-month aspirancy visit to Kentucky, she never fully returned. Her body was home, but her spirit belonged to a cloister in Kentucky. She loved us the same and “adjusted” to being home. However, she reminded me after a day or two that this was “no longer her life.” She assured me that “I don’t have a life here anymore; I need to be going about God’s work for me, and it isn’t here for me, anymore.” She didn’t say this in a mean way; it was just a statement of fact. I was shocked and, I admit, somewhat tender about her words. But deep down, I knew the truth of them. I began to prepare myself for a more final parting to take place at the end of July, when Nora would begin her year-long postulancy. At the end of that time, if she still feels called to the cloister, she will never return home to Olean, New York. Nora’s words reminded me of Jesus’ words to Mary and Joseph at the finding in the temple: “Did you not know that I must be about my father’s business?” Certainly his words cut them a little, but they had to “know” the deep spiritual truth of them. Like Jesus, Nora obediently followed the plan to be with us until the end of July. But she had spoken the words. This visit was temporary, and we must not mistake that. From May until July 26th, when we returned to Kentucky, I prayed for the courage and faith and love to let my daughter go. . .to give back to God the daughter he had loaned me to us for nearly nineteen years. My only daughter. God gave his son for me. Could I place my beautiful Nora back into his arms? I won’t lie to you. . .I cried and cried, countless times, as I looked at my beloved daughter, praying the rosary beside me each night. Tears came to me as I looked at her, across the room at Morning Prayer or during our recitation of the Angelus, many days at Noon. I memorized the sound of her voice and really concentrated on the fact that she was asleep at night, safe in her own room, under my roof. Not one day of her two month visit did I take her presence for granted. . .I treasured the time with my daughter. Well, the 27th of July came. The Gospel reading was perfect for the day — all about finding the precious pearl and buying the field in order to possess the treasure. Nora had found her love for the Lord and desire to give all to Him and to be totally possessed by Him! My daughter is a singular treasure. . .this “pearl” will be joined to the string of precious pearls [in this enclosed Passionist community]. Each pearl is unique; one is not more beautiful than the other. They all add to the completeness of the chain. I contemplated that reading and observed with joy and wonder and awe Nora’s radiant joy upon returning to the cloister. Nothing bad could bring the visible joy and peace and ecstasy she seemed to be experiencing. I prayed more and more for courage and joy in me, as well. Guess what? God gave them to me! I was shocked on the morning of Nora’s entrance; her joy and love were infectious. I couldn’t think about myself. I could only think about my daughter’s joyful, unselfish, pure and free decision to enter religious life, and to give her all to God. What is sad about that? Nothing! Nora entered her cloister with my smiles and my blessing, and I gave glory to God, for calling my dear daughter. She belongs to him. So do you and I! What about you? Are you discerning? 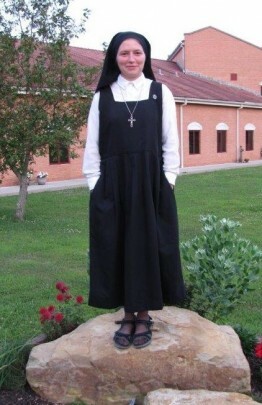 Is your daughter/granddaughter or other loved one thinking of embracing a religious vocation? If so, are you encouraging their free choice or are you just protecting your own tender feelings, and dreading the sacrifice? Don’t be ashamed of your sadness, your tenderness or pain. These are normal feelings, as we have a lifetime of love for our daughters, granddaughters, sisters and friends. Celebrate that love, but don’t spoil it by letting it create an obstacle to their freedom. Pray for courage and love and generosity. You will need all of it. As our parish priest reminded us, we’re not giving up a daughter; we’re learning to hold her in a new way. Don’t deprive yourself of a chance to sacrifice. Don’t deprive God of his beloved bride, your loved one. Be assured of my prayers for you, whether you are an aspiring nun or her family. May God bless you all. May God’s Will be done unto and by all of us, for only through conformity to the Will of God can we know peace and love and contentment in this life, as well as the next.